From left to right: Dr. Michael Goddard, Johnny Knight, Melanie Petersen, Henry Lozano (resigned in November), Dr. Joy Shaw, John Anderson, John Knight, and Eric Thompson. 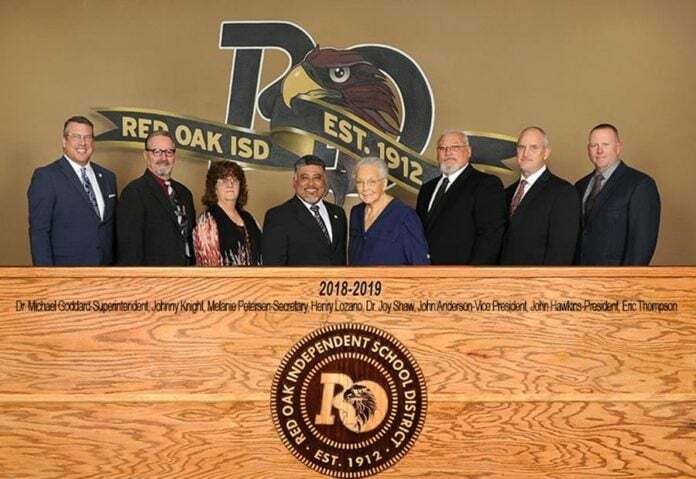 RED OAK—The candidate filing and voting dates have been set for the 2019 Red Oak Independent School District’s Board of Trustee election. The Board election will be held on Saturday, May 4, 2019. The election will consist of a general election with Place 1 and Place 2 for three-year terms, and a special election to fill the vacancy in Place 5 for a one-year term. Candidate filing dates for the Red Oak ISD Board of Trustees election are January 16 through February 15. Interested candidates may pick up and submit a candidate packet at the Red Oak ISD Education Service Center (Administration), 109 W. Red Oak Rd, from January 16 to Thursday, February 14 from 8:30 a.m. to 4 p.m. and on Friday, February 15 from 8:30 a.m. to 5 p.m.
January is School Board Recognition Month, and Red Oak ISD will join the Texas Association of School Boards and other districts across the state to honor the countless contributions of these locally elected advocates for Texas school children and public schools. “School board members tackle a difficult job and shoulder enormous responsibilities. These men and women are elected to establish the policies that provide the framework for our public schools. They provide vision and leadership in their roles as advocates, and they will continue to stand up for public education and guard against anything that takes away from our children or undermines our public schools,” said Dr. Michael Goddard, Red Oak ISD superintendent. Board members are being celebrated by campuses throughout the month and will receive special items from each campus and district at the January 22, 2019, Board Meeting. We have also created special social media and web posts during the month. “It’s more important than ever before that the public support public education so that today’s students are prepared to be productive citizens and the leaders of tomorrow. Please take a moment and tell school board members ‘thanks for caring about our children and giving so much to our community.’ Let them know we support them and that their dedicated service is recognized and truly appreciated,” Dr. Goddard said.